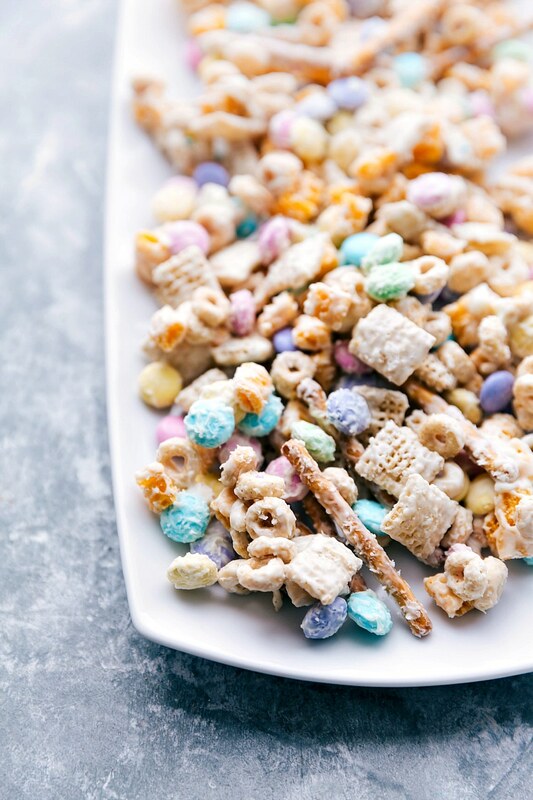 A delicious addictive “bunny bait” snack mix that is perfect for Springtime! 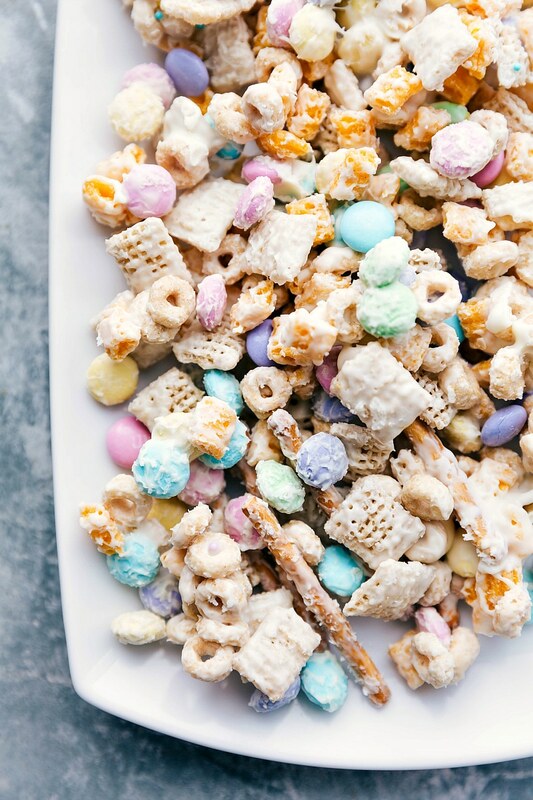 This snack mix is filled with cereal, pretzels, M&Ms, and coated in melted white chocolate. No baking required! Serve this bunny bait as a snack or dessert for Easter! Some of our other favorite Easter dessert recipes to serve alongside this bunny bait: carrot cake, Spring confetti bars, and carrot cake cupcakes. Combine Ingredients: Use a large bowl to add in all the ingredients. The bigger the bowl, the easier it will be for everything to get an even coating of white chocolate. Note on ingredients: This mix is best with ingredients that are generally the same size. While most of the ingredients are similar sizes, regular sized pretzels can easily overpower everything else; grab itty bitty pretzels OR mini pretzel rods. Melt White Chocolate: microwave the chocolate until melted and then immediately toss it with the mix. White chocolate has a tendency of hardening quickly, so work quickly. Let Harden: let the bunny bait stand at room temperature to harden OR if you’re in a rush, stick it in the fridge for about 10-20 minutes. Break apart and enjoy or package up! Get creative: as long as the quantities generally follow the recipe, get creative to what you add. Some ideas: popped popcorn, peanuts or cashews, and/or festive sprinkles! The best tip I have for avoiding burned white chocolate: stir the chocolate often in between the melting process (every 30 seconds) and stir it for at least 20-25 seconds in between each microwave burst. Remember the chocolate is still melting even outside of the microwave. More white chocolate melting tips here. Store bunny bait in an airtight container at room temperature for up to a week. We like this snack mix best within 3-4 days. You can freeze any leftover bunny bait in an airtight container/bag for up to 3 months; thaw at room temperature! 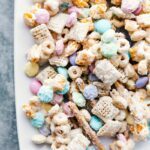 A delicious addictive "bunny bait" snack mix that is perfect for Springtime! 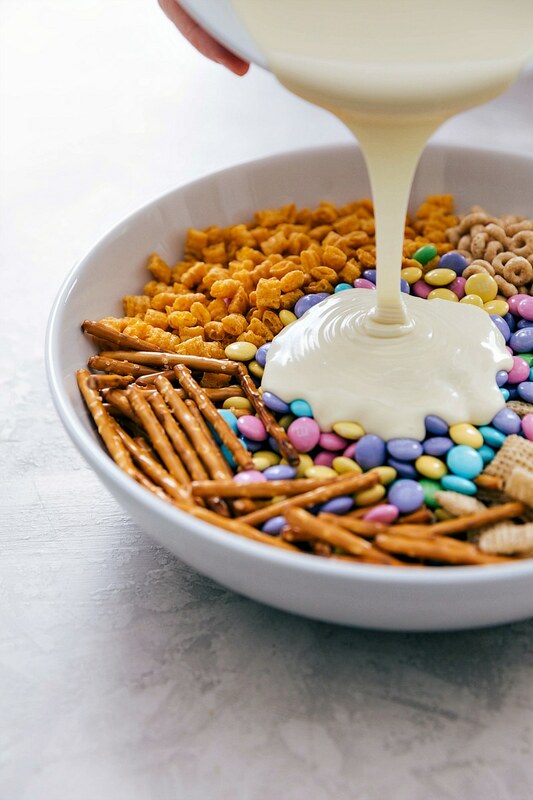 This snack mix is filled with cereal, pretzels, M&Ms, and coated in melted white chocolate. No baking required! 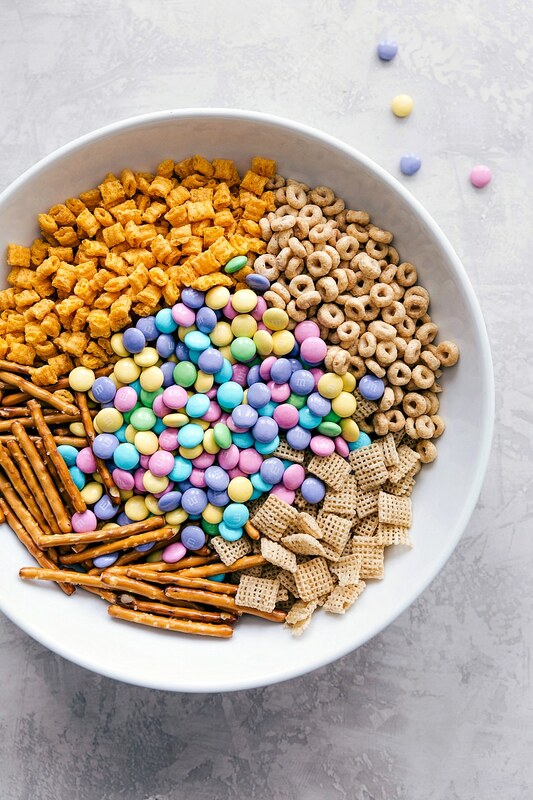 In a large bowl combine the Chex, pretzels, cheerios, and M&Ms together making sure that everything is evenly distributed. In a medium sized bowl add the white chocolate chips and vegetable oil. Microwave for 30 seconds, stir, and microwave for another 25 seconds. Stir until melted and smooth. If needed return to the microwave for a little longer. (Bursts of 10 seconds stirring for 10 seconds in between each burst). Pour the melted and smooth white chocolate over the snack mix. Gently stir until completely combined and then transfer to the prepared baking sheet and spread into one even layer. Allow to harden at room temperature or place in the fridge until firm, about 10-20 minutes. Break into pieces and serve OR fill up snack sized bags and attach the free printable (link to printable above this recipe). Do you prefer corn or rice chex?